Danny was hunting one of our favorite areas last week, an area that our Dad carried us on his back chasing bugles when we were growing up, and came upon this tree. 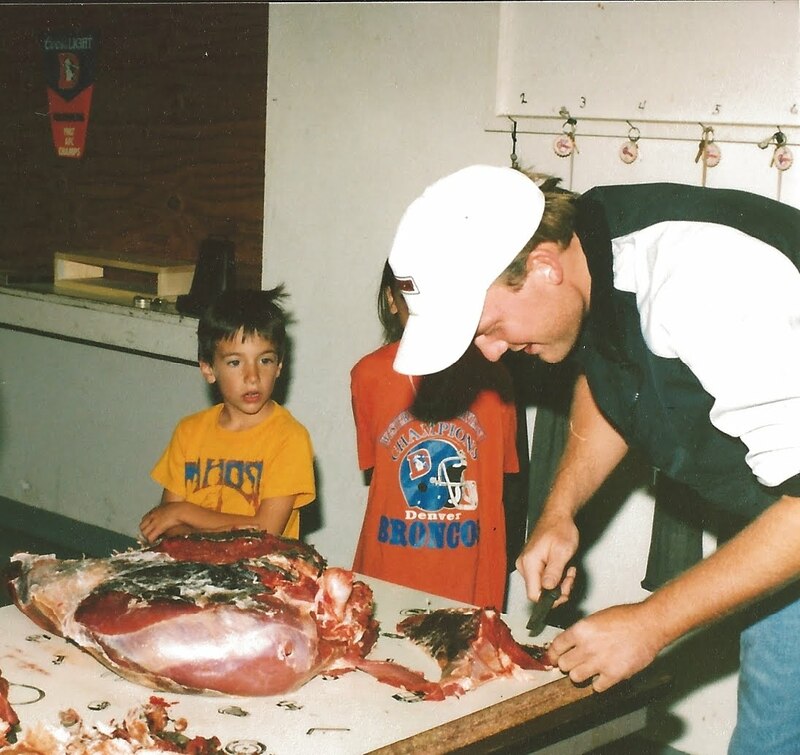 It reads "Chris's 1st elk with a bow, 9/16/8.." I can't tell when it was but it was the late 80's. That was where my Mom killed an elk over 20 years ago. 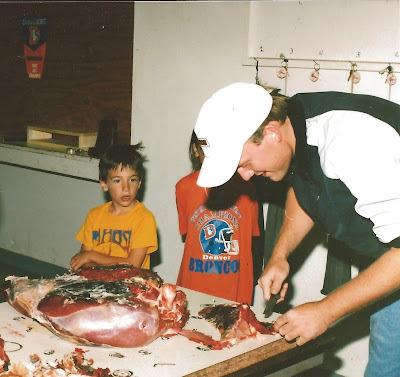 We pulled out some pictures of that elk. Cutting up the elk that year. My Mom's parents are on the right, Dad and Danny in the middle, and my Dad's mom on the left. 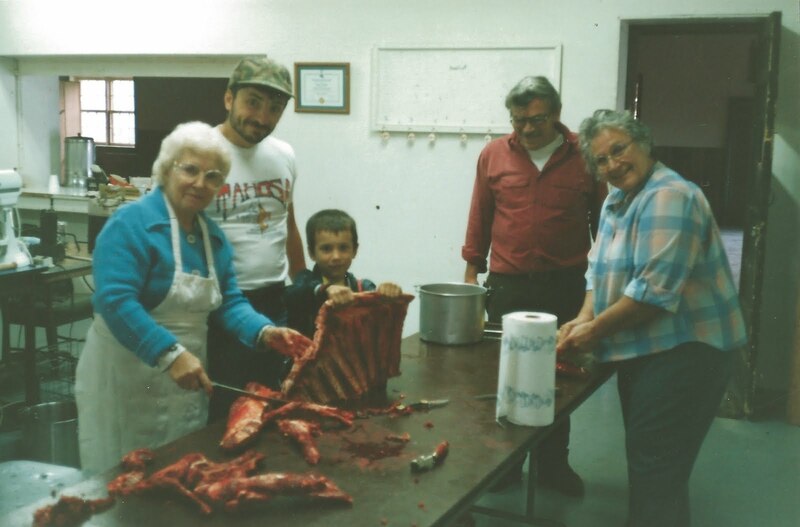 Getting an elk back then called for a family evening of processing. Here I am watching somebody cut some meat. I think he's a cousin somewhere in there. Now on to this years elk hunting! It's still been a little slow but it is picking up fast. Here is a pine martin that Danny and Chad saw while hunting with our friend Matt. Matt had a muzzleloader tag. When they were heading in to the woods we all felt that Matt should be able to shoot a nice bull hunting with Danny and Chad, two very fine elk hunters. Late one evening Danny and Matt glassed a herd of elk on a ridge across the drainage. Chad had a large 6X6 at 15 yards that night but did not get a shot. He was hoping for the elk to take that "one more step" that all bowhunters know so well. They made plans that night at camp to get an early start and try to get to those elk by first light. 1,800 vertical feet later they were below the elk and HOPING that they would come down towards them instead of going down the other side of the hill. One the way up the hill Matt says, "There is NOTHING that is worth this hike". It was a ball buster of an ascent. Matt changed his mind in a little bit. A view of the trees they were hiding in. The elk are making their way down. 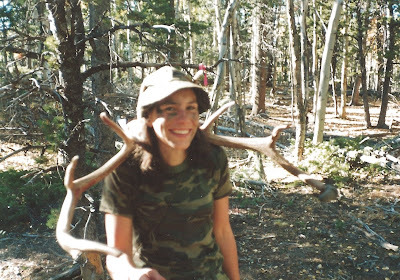 One of the things that draws hunters towards traditional archery is the simplicity of it. Not much can go wrong in the field. With the bull at 100 yards Matt squeezed the trigger on his muzzleloader. Missfire! He squeezed again. Missfire! Five times Matt had a missfire while Danny is frantically trying to find a new primer. The sixth time the gun went off. I'm sure Matt had some mixed emotions at this moment. One of elation for shooting such a nice bull. And then the "AH CRAP" of knowing what kind of pack out was ahead of him. We have another week before we leave for a moose hunt in Canada. Hopefully one of the guys can shoot another elk with the stickbows. Last night we had a heck of a show and a monster bull at 22 yards. One more step...that's always the story.